5 Overrated Exercises…and how to replace them! Even if this was good exercise, this girl isn’t even doing it “right”. The whole idea behind the dumbbell side bend is that you counter balance one side with resistance (usually a dumbbell), with nothing on the other side. 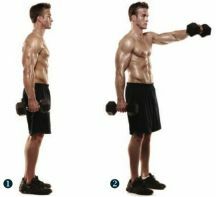 Using two dumbbells completely defeats the purpose of what this exercise is supposed to do. Also, using 15 lb dumbbells wont get you anywhere, no matter your strength level. I do know that power lifters perform these to build up a strong overall core…but with 75 to 100 pounds dumbbells. For your average Joe or Jane, these are a “waist” of time. Just because the abs and obliques and move this way, doesn’t mean they will really get much of a workout. “But I want to lose my love handles!” Well, to be blunt, spot reduction (training one area over and over to lose fat) does NOT work. 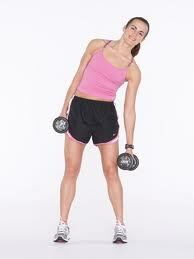 Also, doing these too much could actually bulk up your “love handle” area, making your waist look thicker. Lastly, some trainers and doctors really question the overall safety of lateral flexion of the spine, which could potentially cause serious injury. 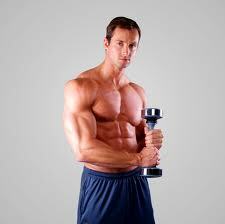 The front raise puts a lot of sheering, downward force on the anterior deltoid head. The front part of your shoulder. If you are already doing some sort of pushing movement (bench, incline bench, shoulder press…) you are already sufficiently working this area of the body. Granted, this exercise can be uses with LIGHT weight as a warmup, prehab, or rehab movement. The main reason to stay away from doing front raises heavy, is overall risk for injury. The Arnold Press will work your entire shoulder, but I feel more emphasis on the front of my deltoid, without the downward sheering force of front raises. 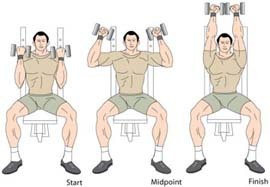 Start seated with your palms facing you, and as you press up, rotate your hand outward so at the top of the lift you are finishing like a standard shoulder press. Sure, everyone wants a flat stomach or a 6 pack. Doing endless crunches wont get you there. As stated earlier, spot reduction just doesn’t work. You would need to do about 250,000 crunches to burn off one pound of fat…good luck. Yes, when you do a bunch of crunches and ab exercises, you feel it. But everyone has abs, it might just be hidden under 50 pounds of fat, or even 1/2 stubborn inch. Also, abs can be done incorrectly, and potentially cause injuries (pulling on the neck, spinal hyperextension, improper flexion). First reason, SPOT REDUCTION DOESNT WORK!!! Most people (females in general) go these because they want to get rid of the stubborn fat that accumulates on their inner thighs. Also, you technically have no “inner thigh” muscle to be working. You have you quads and hamstrings that make up the mass of the leg. The only muscle this exercise really works in the piriformis which is deep inside your hip and no one, except your surgeon will ever see. These machines can also lead to groin pulls. I would MAYBE recommend using this as a way to warm up tight hips, but even then, highly questionable. This entry was posted in Fitness and tagged Exercise Blog, health, muscle building, squat, toning, useless exercise, weight lifting, weight loss, weight training, workout, worthless lifts by Mike Gorski. Bookmark the permalink. Informative post on overrated exercises and how to replace them and will be of great help for those who are new in fitness world. Like to add some tips to avoid exercise injuries here. Warm up before regular workouts and dress properly. Listen to your body, know your limits and stop if it hurts.